Too much Input Power for my Charge Controller? My son has given me four JASolar PV panels. Each panel is rated at 325 W with a Vmp of 37.49 and a Voc of 46.48. I believe that makes them nominal 24V panels. The four panels will be run in series. I recently purchased an EPEVER 4210 charge controller and now I was wondering if it will be able to withstand the input of the four panels. The Charge controller states that Max. PV open circuit voltage is 100V. But does that mean the panels input will make a total of 96v (24V times 4), or will they input 149.96v (37.49Vmp times 4), or will they input 185.92v (46.48Voc times 4). I'm not so much concerned about how much power I may be losing as I am concerned about burning down my shed from this off grid system. I'm only going to connect it to a two 12v 200ah battery bank. In addition the Charge Controller also states that the Max. PV input power is 520W(12V) & 1040W(24V). Does this mean 325W times 4 will be 1300W and too much for the controller? My son has given me four JASolar PV panels. Each panel is rated at 325 W with a Vmp of 37.49 and a Voc of 46.48. I believe that makes them nominal 24V panels. Best to look at the manual before deciding to run them in series! or before deciding on a charge controller as @westbranch pointed out. I recently purchased an EPEVER 4210 charge controller and now I was wondering if it will be able to withstand the input of the four panels. The Charge controller states that Max. PV open circuit voltage is 100V. But does that mean the panels input will make a total of 96v (24V times 4), or will they input 149.96v (37.49Vmp times 4), or will they input 185.92v (46.48Voc times 4). The actual Max appears to be 92 volts VOC at STC (25degrees centigrade). 2 in series would be over the 92 volt max as I read your manual. So the panels would need to be 4 in parallel to work and not have a chance of damaging your charge controller. It might be worth asking them, but it looks like this is what they want from the manual. I'm only going to connect it to a two 12v 200ah battery bank. Will the batteries be in series for 24 volts or in parallel for 12 volts? In addition the Charge Controller also states that the Max. PV input power is 520W(12V) & 1040W(24V). Does this mean 325W times 4 will be 1300W and too much for the controller? As the chart above states the charge controller can handle quite a bit above that amount. In general you should only expect about 75% of the name plate value when the batteries can accept the full amount of incoming current, while in 'bulk'. Thank you.. Your response is much appreciated. The battery voltage will be 12v. I plan to run two 12v batteries in parallel. Would it be better if I ran two strings of two panels each? That would double my amps but lower my Vmp by half......Other than lowering the life of my charge controller, (only 150 bucks), is there any chance of fire? Thank you so much for the manual. 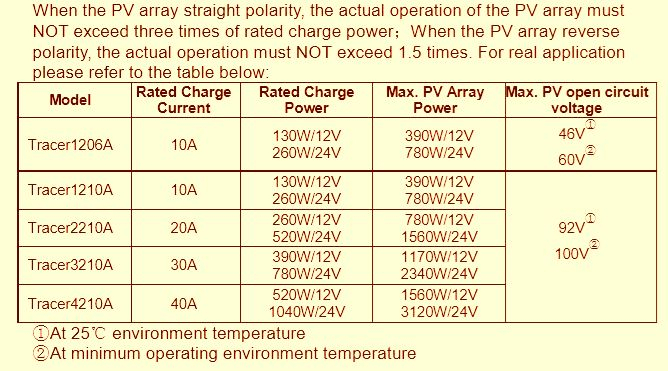 I understand that I should consider running my four panels in parallel, but that would mean my maximum current (Imp) would be multiplied by 4. That would give me 8.67amps times 4 equaling 34.68amps. So you think that would be better for the health charge controller? I am willing to run the panels in any manner since I purchased the charge controller a month ago and I have no idea where the sales receipt has ended up. Thanks so much. The charge controllers are rated on output current/amperage. The trick in this case is that MPPT type charge controller need a bit of 'head' room above the charging voltage. So the voltage may be too low to work well with the MPPT charge controller if you are running the batteries in series for 24 volts. If you are running them in parallel, then you were always going to have too much wattage coming in for the available 40 amp output. Even considering the 75% NOCT (Normal Operating Cell Temperature) value of about 1300/.75=925 watts 925/14 volts (charging voltage for 12 volts) = 66 amps. Well, I'm lucky there. The panels are sitting right up against my shed and the wires will be run through the wall of the shed and right into the charge controller. There is less than two feet of wire between the panels and the charge controller. 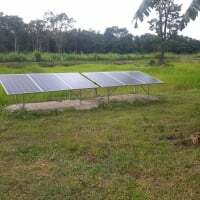 I am definitely going to run the panels in parallel even though now I will need to purchase some branch connectors. 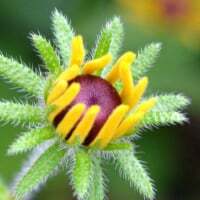 Thanks for your help and everyone's help on this great discussion board. I finally found some place where I can get answers without buying something first or taking a semester of classes. 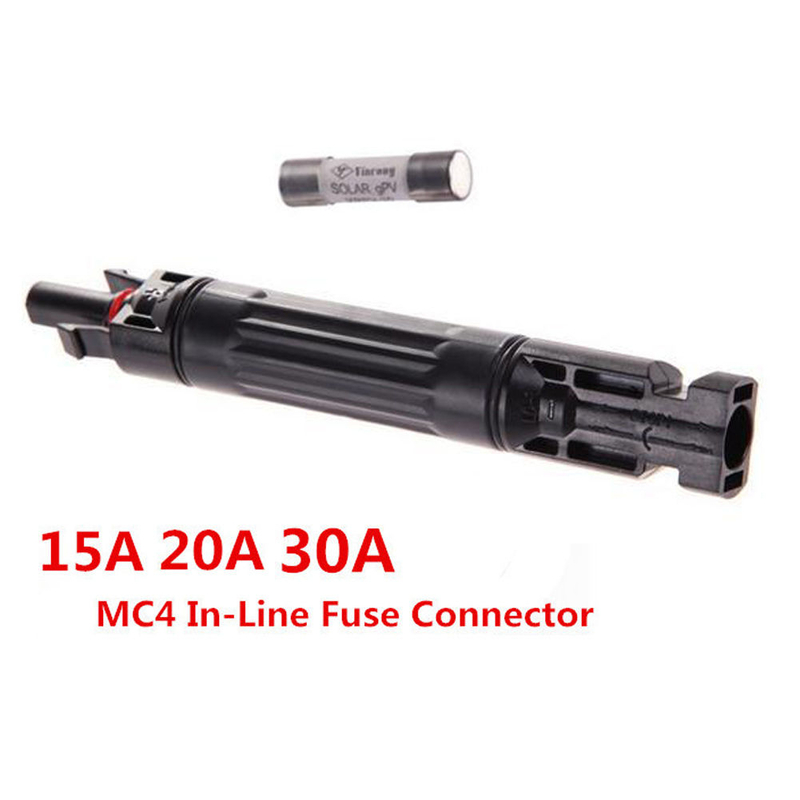 If using branch connectors for combining then you need these MC-4 fuse holders to fuse each panel BEFORE the branch connector. Thanks for the info. My panels are rated at 8.67 Imp and 9.14 Isc so I assume the 15 Amp fuse should be sufficient. But now that we have mentioned branch connectors....I see that the four into one connectors are rated at a pretty low amperage. If I'm running four panels in parallel, shouldn't the branch connector be able to handle the 36 amps that will be traveling through it. Is there one on the market that can handle this? Probably. The fuse rating is usually on the data label on the panel. Nice to have a breaker on the output side as well to isolate the charge controller. ...If I'm running four panels in parallel, shouldn't the branch connector be able to handle the 36 amps that will be traveling through it. Is there one on the market that can handle this? I have already purchased the breakers for the input and the output side of the charge controller and I'm going to order the fuses for the panels, but I'm more concerned about the low amperage of the branch connectors (4 into 1) that I have to connect my panels in parallel with. Don't I need one rated at 40 amps? I hope you purchased some DC rated breakers, DC can sustain an arc much easier than AC so the design is different. They are DC inline breakers (Zookoto) rated at 40 Amps each. I got them since the charge controller is 40 Amp. I will be looking for some 4 into 1 branch connectors that uses 8 gauge wires. Thanks. Caution with using MC4 fuses and connectors, you must shut down the charge controller, before opening a connector in the daytime. The connectors are not rated to connect/disconnect under load, and if you do so, the DC arc will likely destroy the thin gold plate on the connector. Thanks for the info. I will be sure to do that. here is a sample of a 2 PV in parallel from Mid|Nite Solar for their 30 Amp charger. Should help you visualize the parts. Well I don't have half of these parts. Well some isn't required or deceptive. You don't have to have any lightning protection. That's the thing in the lower left hand corner, marked SPD 300. If you are ground mounting these, I wouldn't worry and in fact if you are putting in your shed and there will be some space say a foot between the shed and panels, I'd 'float' the system rather than ground. This also throws out the Ground fault protection. There is some minor risk, I'd say very minor. and even some benefit, a near by lightning strike is less likely to damage your equipment. Well that's good news. Can my branch connectors be four (two into one) connectors instead of the two (four into one). Would this allow me to use the 30 amp branch connectors (that I can find) instead of the 40 amp connectors (that I can't find) ? You would only need 3 pairs of branch connectors, then larger gauge wire from there, on. If you can't find the wired in 8 gauge. I know they make the solid in 4 to 1, but I think it would be a huge pain if you had to disconnect them, particularly with fuses. I'm sure it would be tempting to have all the fuses in one place. I have no real experience with this, but know MC4 can be a pain to take apart even with the proper tools. Personally I'm of the opinion that all these branch connectors are a convince to not do the correct method, perhaps they have a use where voltages are high, 600V+, with low currents, however in circumstances where current is high, voltages low, there are better methods, such as a combiner, where positive terminations are possible. Well this is my solution. (I think it will work) I am going to connect 1 set of the panels in series (2 panels) and the other set of panels in series (2 panels). That will essentially give me two big panels of 74.98 V and 8.67 Amps. Then I'm going to connect those two big panels in parallel. That should give me 74.98 V and 17.34 A going into the charge controller. Well under the 92V and 40 A the charge controller is rated at. Is this correct? and will it work? Thanks for any advice. Now were back to square one. The VOC will be too high for that controller. You need a controller with a 150 volt max. The VOC will be too high for that controller. You need a controller with a 150 volt max. The voc for each panel is 46.48v so when added together will be 92.96 volts. That's between the 92vand 100v that the charger is rated for. So would this damage the controller? That temperature is for Standard Test Conditions of ~75F/20C... If your area has cold overnight temperatures (especially sub freezing), then the Voc/Vmp will rise. In a climate that gets really cold (below freezing), then very roughly Vmp-std-array~100 VDC (Voc-std-array~117 VDC) gives you Voc-cold>~140-150 VDC max. If you are on a tropical island with ocean around your, frequently the temperature never drops much below 70F. Thank you so much for this website. I went there and entered my values and it told me exactly what controller to use. I like that. Now I need to find a way to return this EPEVER controller. I appreciate everyone's time and hopefully I will be able to get back to you guys after I have purchased my new controller. God bless.